Traditional arcade game. Use the mouse to move your bat and return a bouncing ball so it can destroy blocks and score points. 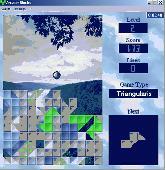 The game includes an arcade mode with a high score table, a suspend save mechanism and several additional features. Swap blocks to destroy them. Play SQUARE or HEXAGON variations. Appealing high quality graphics. Full color and full size window mode. Skin your game with themes that display original blocks and nice animations. Sounds fx and music. Clicking is a fun Arcade-style puzzle game where you earn points by clicking the clusters of like-colored Blocks (in groups of three or more) to collapse the columns. It features: high-quality graphics, good sound effects & music, high scores, 4 levels of difficulty, 10 levels of play, etc. Kingthon Arcade Collection is a collection of arcade games. It includes 180 high-quality arcade games such as classic pacman, snake, James Bomb, Final Fortress, Heli Atack, Linear Assault, Mr. Penguin, Drakojan Skies Acolytes, Squirrel Squash, etc. Arcade Lines is an extremely addictive puzzle game using brilliant graphics, pulsating music and a great variety of different game modes. It is very easy to learn, but not so easy to master! You'll be hooked for hours. The Arcade Park collection is meant to revive the legendary games of the past. It includes the following games: Arcade Ball, Asteroids, Rushman, Digger, Gold Hunter, Galaxy Invaders, as well as military games Real Tanx and Riverside Assault! The point of the game is to place three or more blocks of the same or suitable type in some kind of continuous figure. Lot's of enemies are ready to squash you with the gigantic press. You can get some bonuses like bombs, armor or berserk bonus!